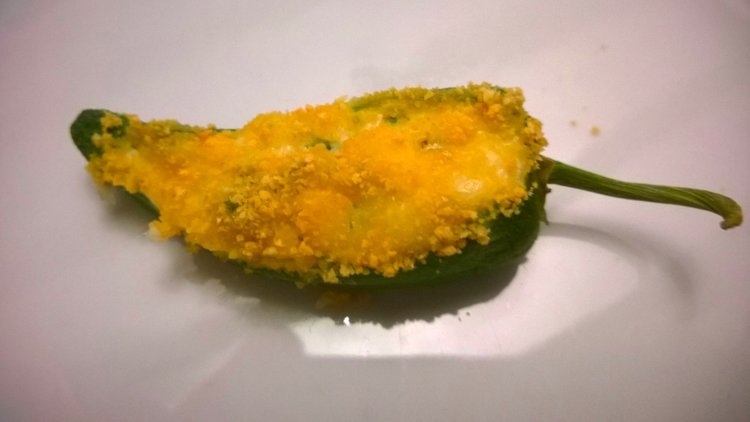 These are a variation on Jalapeno Poppers using Padron chilli peppers, and are baked rather than fried. 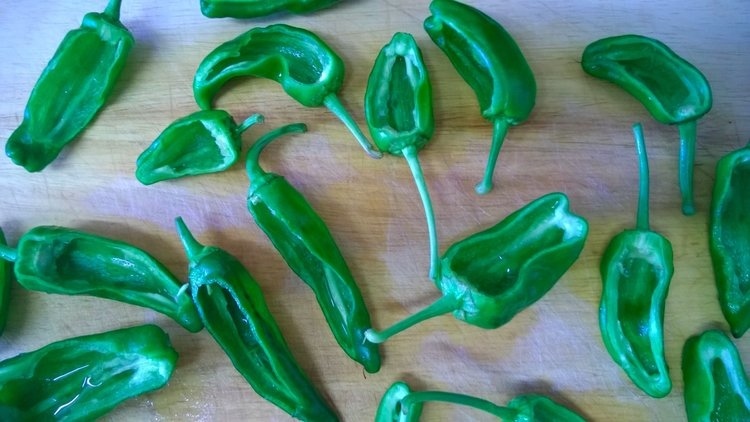 Padron peppers are a type of chilli that varies in heat, most are mild, some are medium heat and the occasional one is very hot, so these add a bit of fun to eating with friends – you never know what you’re going to bite into! – 4oz Grated cheese (I used a mixture of strong cheddar, mozzarella and parmesan – a mixture like that is ideal because you get the strong taste from the cheddar and parmesan, and some stringiness from the mozzarella). 1. Place the chillies down on a surface to find where they sit without rolling, then take a slice lengthways off of what is now effectively the top face of each chilli, leaving the stalks on. You don’t need the bits you slice off, so save them for something else. 2. Thoroughly clean out the insides of each one, removing all the seeds. This is a bit fiddly because you don’t want to break the peppers. I found it easiest to use a small teaspoon to scrape everything up and then run them under a tap to clean it all out. 3. Mix the cream cheese, grated cheese and parsley together. 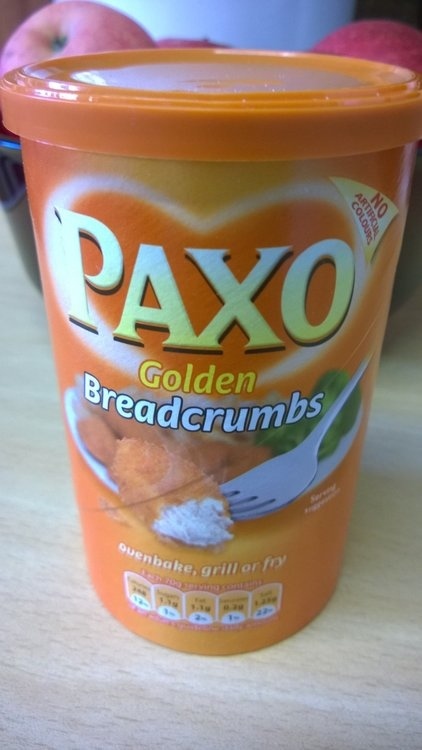 Taste it, if your cheese is very mild you might want to add a bit of salt in – I didn’t need to with mine. 4. Generously stuff all the peppers with the cheese mixture and sprinkle breadcrumbs on top. 5. Arrange them on a baking sheet/tray and bake in a preheated oven 200C/400F for 15-20 minutes until they are browning and bubbling. Serve right away, they need to be eaten hot! I can’t take things that are too hot either, so when I made these, I took a little nibble from the corner on any I was about to eat just to check first! 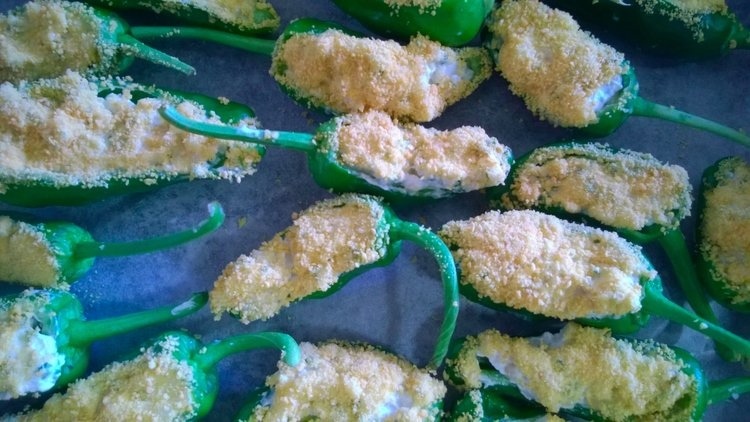 One could do this same recipe with jalapenos of course if one just wanted to avoid the usual fried version, and then there are no shock extra hot ones! I can’t wait to make these. Thanks so much, Vanessa. These were so, so yummy! More soon please Nessie! Tomorrow I’m making big soft pretzels, so they’ll have to do instead! These look like a great party appetizer. I’m thinking you could make these earlier in the day and keep them in the fridge until ready to bake? Oh certainly yes, that’s a good idea actually because they took longer to make than I expected, they were a bit fiddly, so it would be good to get them prepared ahead of time rather than when the party pressure is really on!